What’s been going on at the Conover Farm? We have been busy at the Conover location since our ribbon cutting! Susan Pearce, our program director for the Conover location, and Sarah Lafone, our PATH Instructor, are now serving eight participants together, with two more currently being scheduled. We are growing and growing! As for the facilities, we have also been hard at work! We have put in our biggest sensory trail yet, transformed a storage closet into a therapist office, installed laminate flooring, created a clinic space, installed AC units to keep our therapists cool, reorganized our tack room, and have fixed multiple leaks across the property! How did you hear about Shining Hope Farms? We had been doing hippotherapy with his therapist at the Foothills Equestrian Center, and we were referred to y’all by our therapist. 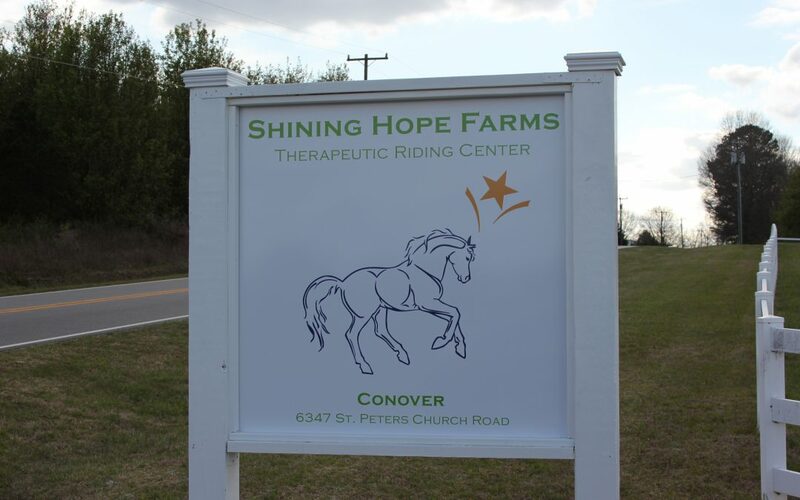 We live in Statesville, and the Foothills Equestrian Center was an hour away in Bethlehem, so the Shining Hope Farms location in Conover is much closer to us! It really has been a blessing. What changes have you noticed since Jeremiah has started Hippotherapy? Every time he rides the horse, it loosens his hips. Hippotherapy mimics our walking, and just after a short time of Hippotherapy treatment, he started sitting up on his own. In general it strengthens his muscles and he walks better after he rides. During a session he rides for 30 minutes, and then walks for 30 minutes. Afterwards his body is much more loose. Before Hippotherapy, he was not sitting independently. Hippotherapy made a difference in his sitting. It also keeps him constantly moving, and gets him out of his comfort zone, not to mention it is really good for sensory engagement. What is Jeremiah’s attitude towards the farm and riding? He is actually scared of animals. He has never been too excited, but today he actually woke up excited for the first time. He loves the one on one time with the volunteers and therapists, and likes to be the center of attention. What are you hoping to get out of Hippotherapy at Shining Hope Farms? Jeremiah just finished kindergarten, and now we are going to try homeschooling! We are excited and nervous, but more than anything we really want to meet his needs. Jeremiah is walking in a walker now, and I want him to continue to gain more mobility and strengthen his muscles. Susan is really excited to be able to continue to work with Jeremiah at the Conover location, and Elizabeth and Jeremiah are excited to be able to potentially continue Hippotherapy into the school year! As the Conover location continues to grow and grow, we want to be able to serve more participants like Jeremiah! We are excited to announce that we are hiring a speech-language pathologist for our Conover location (as well as all of our other locations) and an occupational therapist. You can see our hiring announcement here. The growth of our Conover location and the improvements we have made would not be possible without our wonderful donors and volunteers. Donations help us pay for things like a printer, helmets, therapy equipment, and tack so that we can provide our therapy services at low cost to our participants. If you are willing, we’d love to have your help! You can make a donation and we are always looking for dedicated, passionate volunteers! If you are interested in volunteering at our Conover facility, you can shoot an email to Susan Pearce, our program director, at spearce@shininghopefarms.org.